My family never ate prepared Lamb at our dinner table > I guess in those days it was pricey...I remember eating prepared goat and we was not too fun eating that. I did not know how to cook Lamb??? And what to serve with it. So I said why bother. As I got older and start living on my own. I met people who serve lamb. 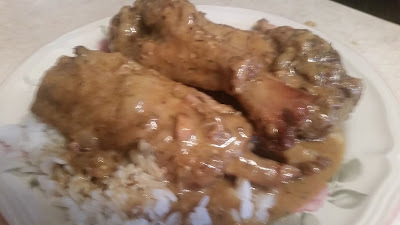 When they had me over for dinner, I did not wanted to be rude so I taste a little lamb and it was very good with the mash potatoes and red gravy and veggies. So I'm a fan! Preheat oven to on slow, 175°C. Dust shanks lightly with flour and salt and pepper. Heat oil in a frying pan. Cook shanks on each side 3-4 minutes, until browned. Set aside. Saute carrot, onion, garlic and spices in same pan 4-5 minutes. 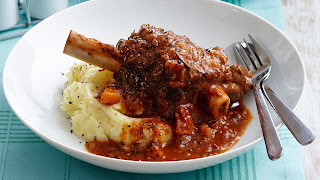 place shanks in a baking dish with tomatoes, wine, beef stock and rosemary. Bake, covered 1½ hours. Place on stove top. Simmer, uncovered 25-30 minutes, until meat is tender and sauce has thickened. Serve with mashed potato or rice.